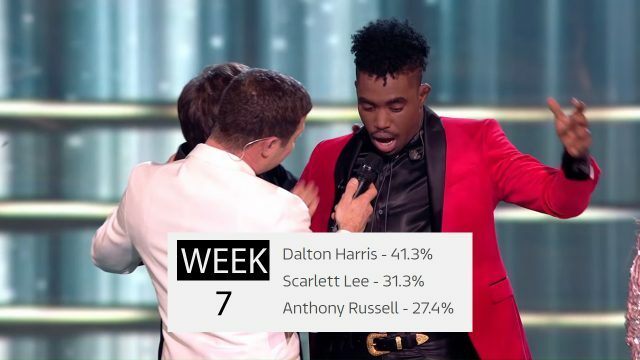 Dalton Harris and Anthony were head to head for the first few weeks of the X Factor Live Shows, voting percentages reveal. Dalton led the way from Week 5 onwards to win in the final with 41.3% of the votes. Over the course of the past seven weeks we’ve seen a number of double eliminations, surprise sing-offs and one triple exit. To give some perspective, X Factor host Dermot O’Leary declared that 2.1 million people voted after the Final on Saturday ahead of Sunday’s results show. WEEK 5 FREEZE -Saturday- after Dalton Harris’ stunning rendition of Listen by Beyonce.